Candy Corn Jelly Shot Mold . . . sweet mercy . . . so cute, so devour-able! Assistant Intern James has been AWOL as well, details unknown, apart from his hair being less blue than usual - and I truly don't know if that is a sign of an uptick or a crisis. However, we are picking up a new intern over the holidays, Intern Max, and am hopeful this will resolve our staffing issues. Anyway, during my sabbatical, many, many jelly shot thoughts have been thunk about the upcoming Jelly Shot Season, or as it is known in the ROW (rest of world), Halloween. Last year, we had some fun with cute kid-friendly treats, but this year, I'd love to really do it up right! Spooky, fun and boozy, that is! So, in addition to some new recipes, we'll be featuring some twists on old favorites. We started with a little remix on an old favorite, Candy Corn Jello. Originally formulated hooch-free, this recipe adapts beautifully to a sweet, flavored vodka. I would recommend a whipped cream variety (Pinnacle makes a nice one, and I have heard others do as well), as it's probably the closest taste to the tooth-achingly sweet candy inspiration for the jelly shot - but really vanilla, cake flavored, or even a little creme de cacao (clear, please, not the brown tinted!) would be lovely. Hope you are all well. I'll be back very soon with a brand new recipe and a bunch of fun remixes! In the meantime, big, giant, squooshy XOXOX's to you all! Use a 3 cup mold, or a 9”x9” cake pan for this little guy. 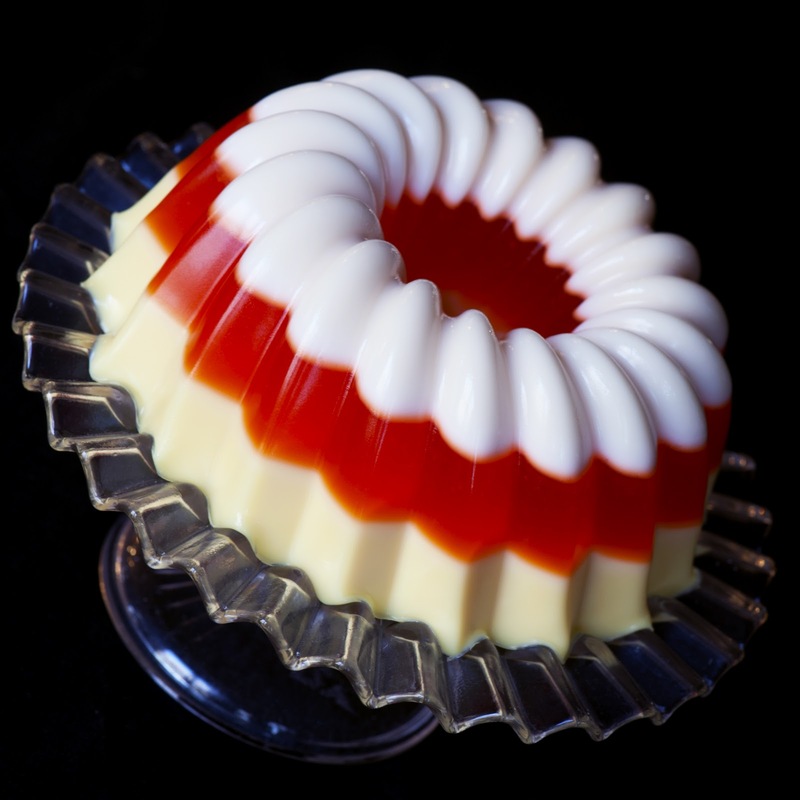 I love a molded jelly shot, its kinda like a punchbowl! Here’s the mold we used: mini Kugelhopf mold. Prepare the mold by spraying lightly with PAM cooking spray, or wiping each mold cavity with a little vegetable oil. Follow by wiping the mold with a clean paper towel. This will leave the slightest reside which will aid in un-molding the gelatin without affecting the taste or appearance. Begin by preparing the milk layer. Pour water in a small saucepan, and sprinkle with the gelatin. Allow to soak for a minute or two. Heat over low heat until gelatin is dissolved, about 5 minutes. Remove from heat and stir in the sweetened condensed milk. Next, stir in the vodka. Place the mold in the refrigerator and chill until set (but slightly sticky when touched), about 30 minutes. Pour water in a small saucepan, and sprinkle with the Knox gelatin. Allow to soak for a minute or two. The mixture may be a little thick initially, but will loosen up. Heat over low heat until plain gelatin is dissolved, about 5 minutes. Add the orange gelatin dessert mix and stir until fully dissolved. Remove from heat and stir in the vodka. Pour mixture into a small bowl and refrigerate until the mixture has cooled to room temperature - this will probably take 15-20 minutes. Ladle gently over the set white layer. Return the mold to the refrigerator and chill until set (but slightly sticky when touched, about 25 minutes. When the orange layer is set (but slightly sticky when touched), unwrap the bowl containing the milk gelatin mixture, and stir in a few drops of yellow food coloring. If the mixture is clumpy, microwave it for 10-15 seconds (make sure it doesn’t get too hot, or it will melt the set gelatin and cook off the alcohol in the vodka). Gently ladle all of the yellow mixture into the mold, over the set orange layer. Refrigerate until fully set – at least 6 hours, or ideally overnight, so the layers can fully bond.